Oxford English Dictionary does a good job of remembering the past history of ‘Chinese helicopter’ in Singapore. Chinese Singaporeans, who only know Chinese but speak little English or ‘broken English’ are treated differently from their English speaking elites and the government. Thanks to OED, ‘Chinese helicopter’ has officially entered the mainstream English speaking world. It records a past history of discrimination, prejudice and insult. Some Chinese educated Singaporeans have voiced out recently and even protest for such a listing. However, it serves as a reminder of our ugly past and a proof of how the PAP government intentionally insults their own citizens. Just imagine, by the same analogy, an Italian speaking Swiss is an ‘Italian helicopter’, a second-class citizen in Switzerland. Similarly, a French speaking Canadian is a second-class ‘French helicopter’ in Canada. Italian and French are both official languages of Switzerland and Canada respectively. What do you think? Not to forget Chinese, Tamil and Malay are official languages of Singapore too. Malay is even the national language. When we object the listing of ‘Chinese helicopter’, we are, in fact, giving the PAP a chance to deny or ignore this insult or discrimination. 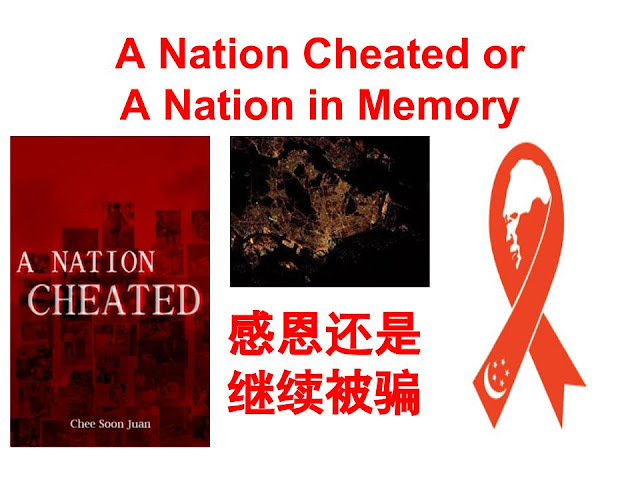 ‘Chinese helicopter’ is not a happy history but it shows how the PAP government intentionally, systematically, consistently targets certain groups of citizens for humiliation purpose. 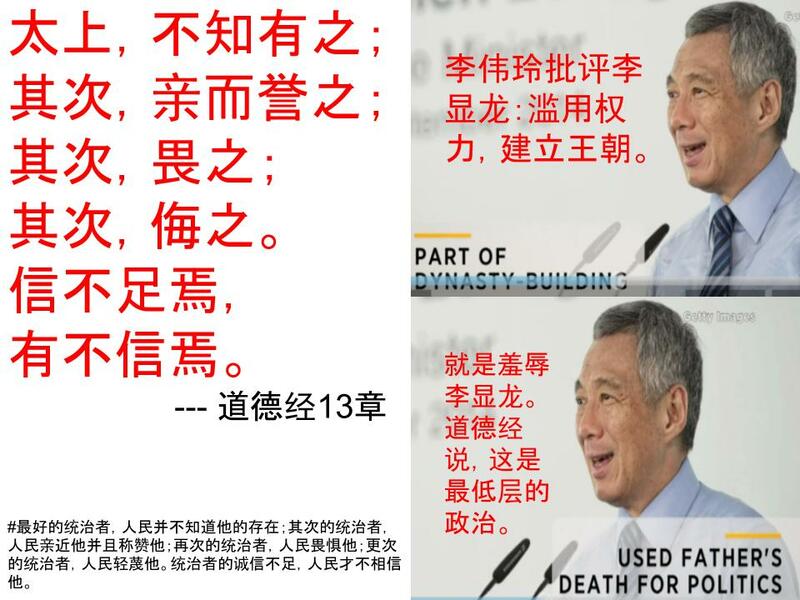 With the passing of ‘Chinese helicopter’, the PAP government has since shifted their focus to other Singaporeans. We now have another type of helicopters - failed PMETs, middle-class problem, 10-year wage freeze, cardboard collectors, dishonest and failed opposition leaders …. Even the elected members of parliament can not escape this discrimination and humiliation. Elected by the voters, oppositions MPs can not have the same community funding, use of public facilities, etc. They even have to seek non-elected PAP grassroots advisers to approve activities in the own constituencies. They also cannot sit together in the parliament. They are treated like second-class MPs. We have to open our eyes and see the ‘Chinese helicopter’ issue in a broader way. If you only narrow it to Chinese educated Singaporeans and think this has nothing to do with you, then you miss the reality of the PAP dirty politics. Singaporeans, who disagree with the PAP government, have to count their luck if they do not face ‘Chinese helicopter’ treatment. The real ‘Chinese helicopters’ are coming and we welcome them with open arms. Chinese tourists are all over the world. You may dislike them but cannot deny their purchasing power. We have to think ahead, beyond money, the soft power of ‘Chinese helicopter’ in the next 20, 30 years. Even in politics, you have to promote yourselves in ‘Chinese helicopter’ way. The PAP announced the Pioneer packages before GE2015 so that they could make ‘Chinese helicopter’ happy. In the recent New York primary, one could find the taste of ‘Chinese helicopter’ as shown in the polling centers below. In the coming California Democratic primary, both Clinton and Sanders have also aggressive put up their ‘Chinese helicopter’ advertisements. They even go further with Cantonese promotional campaign. In the next 20, 30 years, the behavior of Chinese tourists will be very different, especially the younger generation. In the following Taiwanese economics current affairs program, please fast forward to the last 10 minutes of the TV show to learn the latest education changes in China and Taiwan. Comparing to the grading changes in our PSLE examination, the Chinese ‘small change （微调）’ in primary education will really set you thinking - what kind of soft power they want their next generation to have! The change in PSLE is like ‘sitting inside a well (坐井观天).’ - still a exam problem. And the so-called ‘small change’ in China shows the ‘helicopter view’ of their soft power. A primary school graduate will have a vocabulary of nearly 5000 characters that will be sufficient for an adult use. They will also learn more Chinese classics and traditional values. We can expect more civilized Chinese, better behavior and responsible citizens in future. In the age of ‘Chinese helicopters’ and Chinese soft power, where can Singapore find our own ‘Chinese helicopter’ when we need them most? Import? (Under the Constitution of Republic of China, Taiwan new President Tsai Ing-wen gave her inaugural address last Friday. She outlined many present and future problems and challenges in Taiwan, especially the youths. As a Singaporean, these problems and challenges look familiar, perhaps, only different in degree and magnitude. The new Taiwanese government openly details their problems but is short of solutions. Perhaps, they need time to seriously think about the challenges. Tsai’s address was criticised for her ‘emptiness’ (空洞) - problems without solutions. On the China-Taiwan relationship, President Tsai only respects the historical fact (of 1992 mutual agreement). 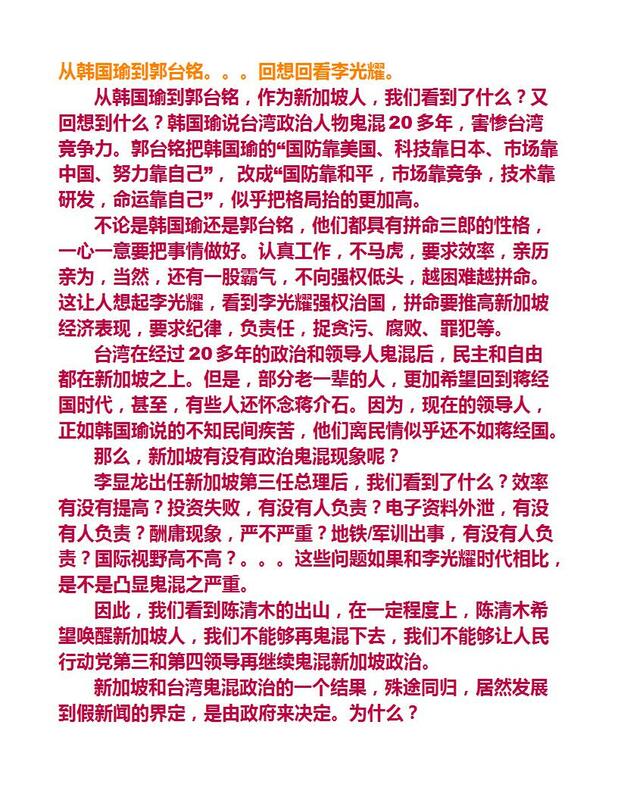 Beijing is not satisfied and considers this is an ‘incomplete answer’ (未完成的答卷). If we consider Chinese B standard in Singapore, ‘incomplete answer’ can still get a ‘technical’ pass. But certainly, for the case of cross-strait relationship, it is too complicated. To solve it, even with a technical pass, it will require the wisdom of collective learning and experience of the Chinese people. Few Singaporeans can play the middleman role like Lee Kuan Yew. Our country's fiscal situation is far from optimistic. To build a "united democracy" that is not hijacked by ideology; to build an "efficient democracy" that responds to the problems of society and economy; to build a "pragmatic democracy" that takes care of the people - this is the significance of the new era. Bukit Batok by-election is a short-term loss of SDP and of course, a short-term gain of the PAP. However, we need to look at the longer term implication for SDP and other smaller opposition parties. Some even suggest SDP chief and candidate, Chee Soon Juan, should go and let other members lead SDP into a new height as he failed to secure 40% of the votes. This, perhaps, is only considering the short-term cost/benefit analysis of BBBE. BBBE is a local election and the PAP wanted to conduct it this way. The mainstream media also helped to make it that way. However, there is no local newspaper or TV station. All BBBE news have to be reported in a national level. If you are consumer of MSM, whether you are in North or South of Singapore, you read the same news. You read good things about the PAP and bad things about the SDP. Finally, you know or mislead to believe there is one good brand and one bad brand. Anyhow, you know there are two brands. This creates a brand awareness for the SDP, even though it is a bad one. So, how low can the bad brand go? It is already at the bottom. If SDP wants to stay in the game, they will bounce back with a committed team. As long as you are committed to play this political game, the Goldilocks conditions for oppositions can happen in Singapore. The PAP has created many Goldilocks conditions (million dollars salary, parliament absentees, part-time MPs etc) for themselves in the past and present. Can they repeat the same in future? The self-created Goldilocks conditions have made the PAP less competitiveness day by day likes the past Chinese dynasties. Internal (e.g. CPF, GIC, Temasek, GLCs) and external (Panama Papers, 1MDB, press freedom etc.) environments also cannot forever support the PAP’s ideal Goldilocks conditions. Has SDP established a stronger, more committed team after BBBE? BBBE has helped SDP to attract more volunteers and supporters. SDP has used this opportunity to enhance the working relationship between party leaders and supporters.This is a small step as compared to the big machinery of the PAP. However, if this commitment can last longer, it will distance SDP and other smaller opposition parties. It will create a third force in the West side of Singapore. One thing is quite certain. SDP will field more candidates than that of GE2015 in the next general election. The PAP government is encouraging senior citizens to take up skills in information technology, like, how to use smartphones and social media. BBBE shows the strength of SDP in this areas, like this one, Ji Pa Ban. In the longer term, digital marketing will be more important than the traditional marketing. In advanced countries or in Arab Spring, this is already happening. Look at the Democratic primary of Clinton vs. Sanders, the game changer has already taken place even Sanders is not nominated. More people are helping SDP during BBBE despite MSM and PAP bad naming Chee. More people also visit and read about SDP online. The question is how committed is the SDP team in the future. Pragmatic Voters or Misleading Voters? Bukit Batok voters were on their pragmatic side when they voted for the PAP candidate last Saturday. Could it also be the misleading information resulting to the pragmatic decision? Worst. If the pragmatic decision is based on a misleading information. The pragmatic side needs a qualification. Singaporeans are known to be pragmatic lots as we are 'kiasi and kiasu'. It means Bukit Batok will be better off under Murali as he is a government MP while Chee Soon Juan, being an opposition, has nothing to offer. What’s worrying is the misleading information that the PAP and the Press, especially the Chinese media, trying to influence voters as in the past general elections or by-elections. Older voters who have no alternative news will base their pragmatic decisions on misleading reporting and distorted news. And Bukit Batok has quite a high percentage of older voters. So, it can be a misleading ‘pragmatic side’ thanks to our 154th free press ranking in the world. For this by-election, it even go further to character assassination. A below 40% votes for Chee is a disappointment. Some even argue with this performance, Chee or even SDP will never get into the parliament. Without the character assassination, will Chee get another 1.3% votes to pass through the psychologically support base? It is very likely, especially for the older voters’ pragmatic side. But to get >40% and to get 50.1% is totally different story. It will be very hard for oppositions in Singapore to get 50.1% due to grassroots playing ground. All PAP candidates will receive strong support from PA, RC, CCC, grassroots bodies, non-profit organisations etc. The press generates the misleading news or half-truth reports. And the grassroots reinforces them with a personal touch. Finally, the voters make their pragmatic decisions. SDP is unable to break this link. Chinese media is the weak side of SDP. 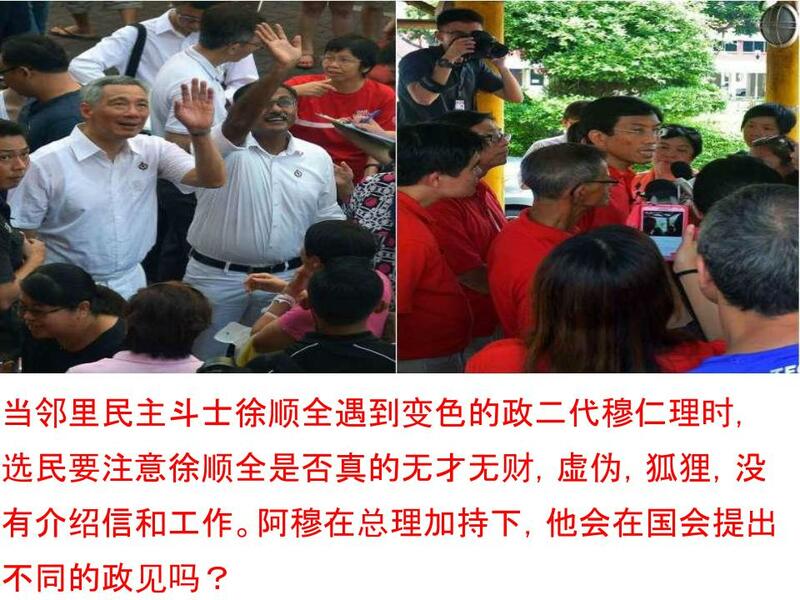 SDP also cannot give a personal touch to the neighbourhood residents. A better educated SDP volunteer may lose out to a sessional grassroots leader in explaining the misleading reports. And the PAP has obviously seen this weak link long long time ago.